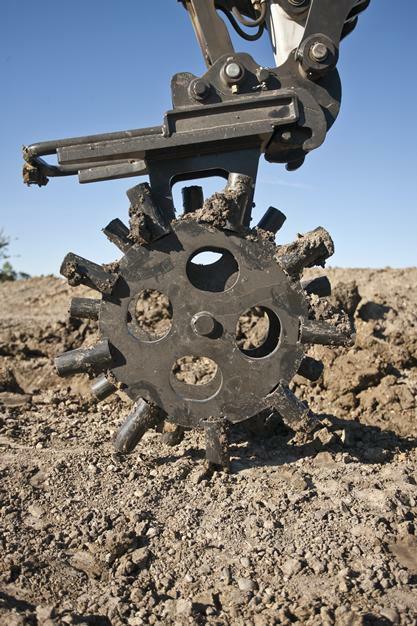 Compact backfilled trenches with the powerful force and labor-saving efficiency of the packer wheel attachment. While reducing the need for conventional compaction equipment, the packer wheel also promotes on-the-job safety by eliminating the need for a person working in the trench. The compact design of the packer wheel allows it to operate in small areas, increasing the versatility of the carrier. No auxiliary hydraulics are required to operate. The wheel rolls through the trench using the carrier controls. The weight of the wheel and down pressure from the carrier provides the compacting force. While in the trench, the open rim sheep foot design of the wheel penetrates through the lift of backfill to compact the fill from the bottom up rather than from the top down. This eliminates bridging and voids for better compaction. The depth of the lift can be varied to match moisture content, texture and other soil conditions. Compact Design: Features an 11-in. wide wheel, designed for maximum performance when compacting backfilled trenches and smaller areas such as around fire hydrants. Double-Spike Sheep Foot Design: Sheep foot design of the wheel easily penetrates through the lift of the backfill, compacting fill from the bottom up. Eliminates bridging and voids for better compaction action. Lift Depth: Can be varied to match moisture content, texture and other soil conditions for maximum operating performance.